Army bases are closing down, but the future of fortresses set up by the British in Northern Ireland is less certain. With a fragile peace in progress, they continue to stand in towns and strategic areas, reminders of a violent past. 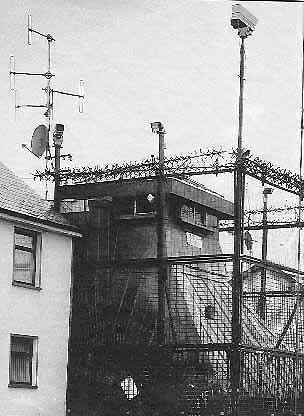 Nearly every police station and army base in Northern Ireland is protected by metal walls, anti-rocket mesh and airlock-style controlled entry systems.To a local, the ungainly fortresses soon blend into the background, adding to the nagging tension of the place, but they hit with a jolt of recognition after a period abroad - this is home. The British Army is particularly proud of its ring of 10 watchtowers dotted through the rolling drumlins and smiling fields of South Armagh. The area, scene of mythological Bronze Age battles and now the epicentre of resistance to British rule, is known as God's own country to the locals, and bandit or ambush country to the squaddies who patrol nervously under helicopter cover. IRA road signs warn that the local snipers are only "on hold". Some towers command strategic points, like the Moyry pass, used to control the natives since the plantation of Ulster in the 1600s. Others are more specific. In 1986, two towers, Golf Two Zero and Golf Three Zero, were built at a cost of millions to watch the home of the local IRA commander Thomas "Slab" Murphy, a millionaire terrorist grown rich on smuggling and extortion.Murphy, who rose to become the IRAs chief of staff, masterminded its Libyan arms importation and its British bombing campaigns from the mid-1980s right up to the Canary Wharf bombing in 1996. His home straddles the border, but every car number plate entering his farm, and every face, is recorded and logged. Even during a ceasefire, Tom Murphy is a man worth watching and, in any case, republican dissidents are strong in the area. The maroon Cavalier used by the so-called Real IRA to carry the explosives that killed 29 people in Omagh, in August 1998, was logged moving north with its deadly cargo by two other watchtowers, Golf 50 and Golf 10, near Crossmaglen. "The towers will be the last fortifications to go down.We'd lose bases first," a senior army source said. 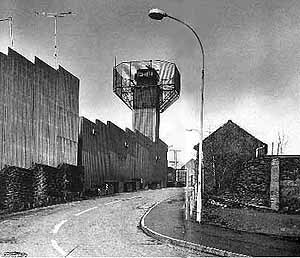 The heavily defended British Army barracks in Newtonhamilton, South Armagh, a region with a history of IRA terrorism. In one such incident, In 1975, four Protestants were killed and seven injured when two masked men entered the local Orange hall and fired at random into the crowd. The towers are high-tech fortresses with rooms buried beneath, where soldiers can live for months at a time. Computer terminals are linked to the main military intelligence databases, Vengeful and Crucible, and video enhancing equipment allows soldiers to see for miles, even across the border to the Irish republic. They are hated by the locals in this most republican of areas. In Londonderry, one observation tower, perched above the city's historic walls at Bishop Street, was given a coat of stone cladding, like a suburban house, in a vain effort to make it blend into the Williamite fortifications. Some towers are called 'sangars', a military term from the Raj era, meaning stone parapet. Blots on the landscape they may be, but some of Ulster's vanishing fortresses are now regarded with something approaching nostalgia. In 1998, Ivan Barr, the Sinn Fein chairman of Strabane council, campaigned to have an inelegant checkpoint called the Camel's Hump preserved as a tourist attraction. 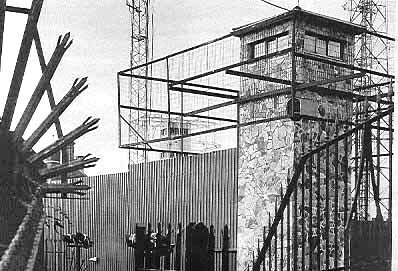 Barr wanted its watchtower used as a "viewing gallery", but the army was having none of it. "Does he think we were born yesterday?" one officer asked, arguing that the fortresses hold structural secrets, like anti-mortar measures, which must be protected by demolition. 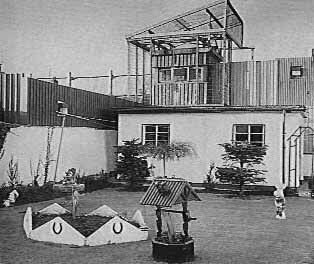 The RUC station looms over a home and garden in Strabane, Co Tyrone, the border town blighted by civil rights rallies In the 1970s, and both IRA and INLA violence in the 1988s. Since the first IRA ceasefire in 1995, 31 of the British Army's 105 bases in the province have been closed. Most have been knocked down, but six in Fermanagh have been mothballed, locked up and guarded. Unionists regard them as a comfort blanket against the resumption of violence, but the army would rather bulldoze them. A row of ‘sangar fortresses' dominate the landscape at Magilligan Point, Co Derry. The army camp here was used in 1971 for the controversial internment without trial of IRA suspects. There are other reasons for liking the forts. One man bought a house in the shadow of Bessbrook Mill barracks (home to Britain's biggest helipad) after the IRA threatened to murder him as an alleged drugs dealer. If peace holds, they will all come down. Source: The Sunday Times Magazine, April 9 2000.